Not being too much into jewelry making, I love it when I find things that are ready made for me to add my beads to it to make it original and one of a kind. 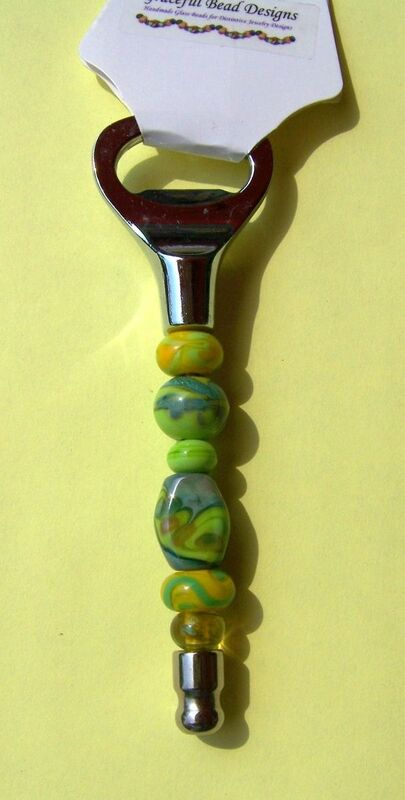 The design of this bottle opener was created by me using random beads from my stash mixed and matched to create a one of a kind bottle opener that would make a wonderful gift for any occasion. The beads I used on this bottle opener are all made by me with Morretti glass. The primary color in this design is a light pea green. I chose each bead to compliment the others. The focal bead was created using some silvered glass so it is a little different. I used different shapes and sizes but they all coordinate to create a cohesive design. My beads are all top quality, have been properly annealed in my digitally controlled kiln, and are all dressed and ready to be used. I personally guarantee my work and if for any reason you are not satisfied I will gladly replace, exchange or refund your purchase after return.